Proposal 1: The Devil You Know is Better Than the Devil You Don’t Know. There is a lot not to like about Proposal 1, which is why polling suggests it could go down in flames. When Republicans recklessly cut business taxes by 1.6 billion, it was just a matter of time before someone had to pick up the tab to pay for essential needs like roads. If Proposal 1 were to pass, the people who would feel most pain would be lower income folks, which is why this is called a regressive tax. That sting would be partially offset by bumping back up the earned income tax credit for about 800,000 Michigan families. While the initiative prevents money from the school aid fund being shifted to universities, it doesn’t stop it from being spent on community colleges. This shell game is lifting the school aid fund of over $250 million dollars this coming year. Nothing is stopping the legislature from fully funding community colleges from the school aid fund which could mean swiping another 135 million. Despite all the negatives about proposal 1, I still support it. The proposal will increase road funding, school funding, and at least provide some softening of the blow for lower income working people. While I hate to subsidize the business industry, whose tax money should be covering these essential needs, I’m left with no other choice. If this ballot question fails, “plan B” will likely be more regressive and harmful to schools. After all, the current legislature is more conservative and more in the pocket of big business than the last one. In this case, the devil you know is better than the devil you don’t know. Vote yes! Here are five reasons to vote for Michigan’s own Joshua Davis who is in the top 8 on The Voice. 1. Joshua Davis has more hometowns than Mitt Romney, but they’re all in Michigan! Davis was born in Marquette and spent many of his summers there. He grew up in Oak Park giving him the kind of suburban Detroit “cred” that Kid Rock brags about. Davis went to college in East Lansing and honed some of his skills playing weekly in a band there. Davis now lives in Traverse City. He has played in many of the big towns and small towns in between his hometowns and yours. 2. Joshua Davis believes in collective bargaining. He introduces his song “Working Man’s Hymn” with a shout-out to those who are fighting for those rights here in Michigan. By the way, “Working Man’s Hymn” might be Davis’ best song. Check out the song below. 3. Joshua Davis has some great insight into the Israeli Palestine conflict. Davis is half Jewish. He visited Israel when he was younger and more recently he traveled to Palestine as a “cultural emissary.” He wrote a whole album about the experience and gave a Ted-X talk about it too. Both his music and his talk are really enlightening, especially for those of us who have never visited either Israel or Palestine. 4. Joshua Davis has a lot of courage. Most of us are afraid to strike out and chase our dreams the way Davis has. Davis has been a full-time musician since graduating college. His appearance on The Voice is just another step in his journey. The guy is pretty gutsy! 5. Joshua Davis is more talented than the rest of the singers in the Voice’s top 8. Depending on your taste in music, you may think there are more talented singers left in the contest. However, none of them can play guitar the way Davis can, and none of them have written the kind of songs Davis has. His choice of genres is out of the mainstream, but his talent is out of this world. Check out the official #davisnation page to find out all the ways you can vote. After Four Years of Blogging, is it Time to Stop? Four years and no scores ago I posted my first article on this blog. A lot has changed since then. I have a third kid in tow, a larger yard to mow, and I’ve pretty much let my physical fitness completely go. While my life changed before my eyes, the political landscape hasn’t change much at all. Governor Snyder is still in office and his policies still favor the elite over the working class. He is still stealing money from public schools by transferring school aid money to the general fund. Despite blogging, writing letters to the editor, writing letters to my representatives, protesting, networking, knocking doors, and crying in the fetal position, not much has changed. There have been good things that have come from all this blogging. I had a post that was shared over 8,000 times, and that was a pretty good feeling. Sometimes people reach out to thank me for putting into words what they are thinking, and I appreciate those conversations. My trip to Netroots Nation last summer allowed me to meet cool activists and bloggers like Chris Savage at Ecletablog. It also gave me an opportunity to meet U.S. Senator Elizabeth Warren and Michigan Senator Gretchen Whitmer. These are two of the most capable and charismatic people on the progressive team. I hope someday to see them leading their respective executive branches. In the past four years I’ve also seen several good progressive blogs come and go. I think I know why these blogs die nearly as fast as the Mayfly. It is hard to find time to research and write. It’s hard to find the energy. Most bloggers aren’t even able to cover their expenses with their blogs ads. Then there is a chance that their employer, or a potential employer, won’t approve of them making so much political noise. There is also the potential for a combination of all the aforementioned. So at the four year point, I know I’m not done quite yet. I have several posts in the pipeline about the shortcoming of for-profit charter schools. I have more to say about employers paying a living wage and consumers helping those efforts by buying local. But at some point, I might run out of energy, or I just might run out of topics that haven’t been regurgitated like so many Mayflys from mother Robin to her baby. Maybe instead of writing I’ll figure out a more effective way to promote change in the political landscape. Whatever the case may be, when the time comes, I’ll make like Forest Gump and just stop. I’ll let you know when that time is. For the moment though, please keep reading. I appreciate you giving me a few moments of your day, and I’ll try to make it worth your time. 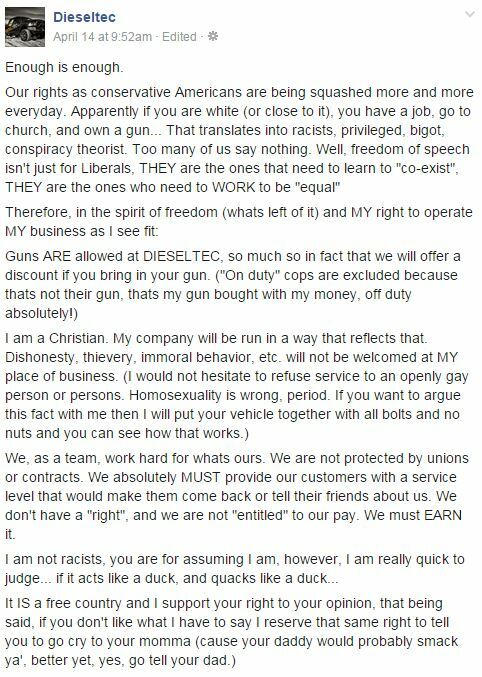 By now you may have read the bigoted remarks of Brian Klawiter who owns a diesel repair shop in Grandville called DieselTec. Klawiter went off on his company’s Facebook page saying because he is a Christian he would . . .
“not hesitate to refuse service to an openly gay person.” He also said he will “offer a discount if you bring in your gun” unless you are an on duty police officer. What you may not have read is all the comments on that Facebook post. There are the run-of-the-mill comments supporting and condemning his view, many of which attempt to determine “what would Jesus do.” There is a posting of his criminal record and a link to the ethical standards of one of his main suppliers, which he seems to be violating. There are many hilarious memes and scores of pictures of men embracing men, an obvious attempt to irritate Klawiter and his supporters. However, the most powerful comment came from a self-described gun toting conservative. Joe Quisenberry said . . . Lets hope that Quisenberry’s comments are indicative of a move towards tolerance by the more sane members of the political right. Perhaps someday “liberty and justice for all” will include gay people who engage in such offensive and outrageous acts as buying a cake or getting their truck fixed. Screen shots for referenced quotes. The Mackinac Center for Public Policy has released a statement announcing that the Herbert H. and Grace A. Dow Foundation (Dow Foundation) has given them one million dollars for “supporting research to help public schools become more responsive, measurable and efficient.” Grace A. Dow, wife of Dow Chemical Founder Herbert H. Dow, established the Dow Foundation in 1936. Grace was a teacher until the time of her marriage according to the foundation website. Dow Foundation grants are given “for religious, charitable, scientific, literary, or educational purposes.” The Dow Foundation supports many worthy causes and has given out over 531 million dollars since 1936. While it is great that the Dow Foundation is donating a million dollars for educational research, it is troubling that the Mackinac Center for Public Policy is the organization conducting the research. The Mackinac Center lacks the necessary credentials to be conducting bonafide educational research. The Mackinac Center’s Director of Education Policy is Audrey Spalding. Spalding is a journalism and economics major who previously worked as a reporter. Spalding works under Research Director Michael Van Beek. Van Beek holds two degrees in history. 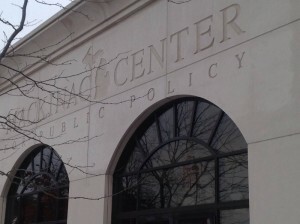 It’s not just that the Mackinac Center lacks trained personnel to conduct educational research, it is that they also support initiatives that would be damaging to public schools. For instance, the Mackinac Center supports the use of tax payer money for vouchers for private schools according to Van Beek. However, 69% of Michiganders opposed vouchers when given a chance to vote on them in the year 2000. Additionally, the Mackinac Center oppose government collective bargaining, a right most public school teachers hold dear. Educational research is a noble cause for the Dow Foundation to support. However, supporting the Mackinac Center is not supporting education, it is supporting an organization with an anti-government political agenda. There are many non-political organizations that would put the Dow Foundation grant to better use. The American Education Research Association (AERA) might be a good candidate. If you too believe that the Mackinac Center’s agenda for public schools is harmful, join me in signing the petition asking the Dow Foundation to rescind their grant to the Mackinac Center and instead give it to a more qualified and more deserving institution. Human beings are great at justifying pretty much any belief they have. For instance, both the Bible and the U.S. Constitution were used to justify the continuation of slavery in the United States. Likewise, people seem quick to justify multi-million dollar college coaching salaries for men’s sports but not for women’s sports. While not as nefarious as slavery, discrimination is still something we should be unilaterally against. Which is why we should also be against the contract signed by Jim Harbaugh, University of Michigan’s new head football coach. According to data from the U.S. Department of Education, the average salary of a Division I-A coach of a men’s team in 2013 was $531,826 while head coaches of women’s teams averaged only $140,457. The University of Michigan men’s head coaches averaged $578,279 and the women’s head coaches averaged $175,339. So the University of Michigan’s pay gap is not out of the ordinary for college coaching. It is out of the ordinary among all professions though. According to a report by the American Association of University Women (AAUW), college educated women make 7% less even when controlling for “occupation, major, hours worked, parenthood, and many other factors.” While college educated women are paid 7% less than their male counterparts, college educated coaches of women’s teams are paid 379% less than coaches of men’s teams! The most often used justification for such gender discrimination in college coaching pay is the amount of revenue generated by men’s sports. According to the previously cited data from the U.S. Department of Education, University of Michigan (UofM) men’s teams netted almost $60 million while women’s teams actually lost a little over $20 million in 2013. Some have said that paying more for coaches whose sports generate more revenue for their college is akin to paying salespeople for generating more revenue for their business. Yet, that argument falls short when you consider Harbaugh is making seven million dollars this year while UofM’s President is making less than a million dollars. Harbaugh is only in charge of the football program while Mark Schlissel is in charge of the entire University! Surely, no General Motors car salesman makes more than the CEO of General Motors, let alone seven times more! But more significant than that is understanding public universities are not private sector businesses. At a public university, you should be paid for the amount of time you put in, your commitment to the program, and the quality of the outcome, not for the amount of revenue you raise. That is how it works in the high school ranks. The coaching contracts for Rockford High School and Clarkston High School reveal their head football coaches are paid the same amount as their head women’s basketball coach, assuming they have the same number of years of service. These are two big time high school programs with multiple state titles in football, and I’m sure the football program brings in more revenue than the girl’s basketball program. Other sports that require less of a time commitment pay less. I’m not naïve. I do not expect Division 1-A universities will reign in coaching pay on their own. After all, they are in the midst of an arms race. The only way to fix this problem is to do it as part of reforming the entire non-profit system. After all, examples of outrageous compensation exist in all areas of the non-profit world. What we need is a maximum wage for non-profits. For individuals who want to make a fortune, they should move into the private sector. A public university should not be able to compete with a professional league when it comes to coaching pay. Side note: The NFL is actually a non-profit that pays their commissioner 29.5 million a year. If men’s coaches were paid less in college, and if pay were equalized, there would be more money to take care of the athletes who actually play the game that people come to watch. Money could be set aside to pay for future health issues that occur as a result of playing the sport. The same day that Harbaugh was named UofM’s head coach, Governor Snyder signed legislation to prevent student athletes from unionizing. So players will not be able to make these changes through old fashion organizing. Before you go criticizing me as some leftist intellectual who is anti-football, consider that I coached football for the better part of two decades. Before you criticize me for being a Michigan State fan, which I am guilty of, consider that I made UofM the focus of this article only because their coaching hire has been in the news non-stop these past several weeks and that makes this discussion timely. Before you go discounting my entire argument, ask yourself if you would have used the Bible or the Constitution to justify slavery if you had a stake in the slave trade industry. Just because you can justify your argument does not mean that it is moral, ethical, or that it should be legal. The Free Press article that fails to mention the Mackinac Center’s President’s pay. 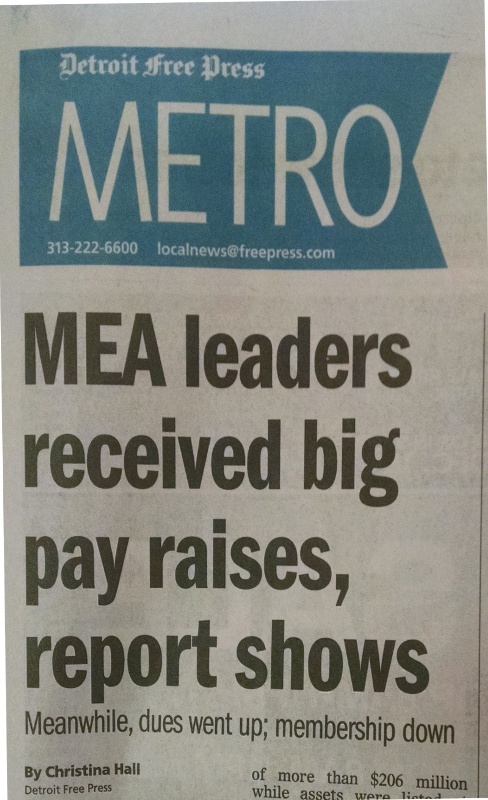 The conservative “think tank” Mackinac Center For Public Policy just issued a new report called “MEA Executives Take Big Pay Raises While Liabilities Continue to Grow.” The Detroit Free Press liked it so much they made it into an article of their own and ran it on the third page. Not surprisingly, there is more to the story than what appears in the Mackinac Center report or in the Free Press article. The Mackinac Center uses the MEA Labor Organization Annual Report to highlight the pay increases of four of the Michigan Education Association’s (MEA) leaders. Their report notes that Secretary-Treasurer Rick Trainor’s salary increased 44 percent, Vice President Nancy Strachan’s salary increased 16 percent, President Steve Cook’s salary increased 11 percent, and Executive Director Gretchen Dziadosz’s salary increased 6 percent. The average raise of these four individuals is 19%. Dziadosz was the highest paid MEA leader last year making $224,858. I am told, but don’t have proof, that these salaries include reimbursements and therefore do not paint an accurate picture of these employee’s compensation. However, let’s just assume that the Mackinac Center’s numbers are correct, and then let’s turn the spotlight onto the Mackinac Center itself. According to the Mackinac Center’s 2012 and 2013 990 forms (they are a non-profit too), Mackinac Center President Joseph Lehman received an 18% pay hike. Lehman was compensated a total of $233,401! So Lehman makes more than anyone in the MEA, and his percentage raise was greater than the raise received by three of the four MEA members that the Mackinac Center targeted. Unlike the MEA’s report, the Mackinac Center’s report leaves off some of their top staff members. For instance, Audrey Spalding, their Director of Education Policy, is not listed on the report. I was particularly interested in her compensation since I recently uncovered what I believe to be a major conflict of interest regarding Ms. Spalding’s service on a charter school board in Taylor. Another reason that the Mackinac Center lacks credibility in this debate is that they don’t disclose their funding. 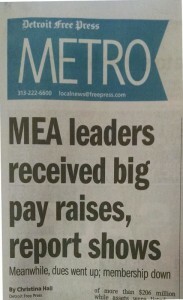 We know the MEA’s executives are being compensated by 144,000 members who voluntarily pay their dues. Meanwhile, the Mackinac Center operates via so-called “dark money.” I’m sure if they would release their donor list we would find the names of some of Michigan’s billionaires, whose own wealth increased 22% last year. If, I say if, Michigan Education Association Executives took home big raises last year, then I’m disappointed in their leadership. Yet, I’m wise enough to know better than to take the Mackinac Center’s word for it. Since their inception, they have taken to undermining public schools, teachers, and workers of all kinds. They are a propaganda machine for conservative millionaires and billionaires whose main goals are to profitize everything, pay as little tax as possible, and to destroy any organized opposition to their way of life (i.e. unions). As long as our “free press” does as bad a job of reporting as the Free Press did in this instance, the Mackinac Center will continue to make progress for the millionaires and billionaires behind the dark money curtain. Oh how conservatives have taken to bashing President Obama for taking executive action on immigration. Even Saturday Night Live poked fun at Obama for using an executive order instead of waiting for Congress to pass a bill, which many believe would never have happened. Yet, conservatives are pretty quiet on the 51 executive orders signed by Governor Snyder. One of these executive orders caused serious problems for charities, even delaying much needed fundraisers for one charity by nearly two years! What follows is just one example of executive action gone wrong. Early in 2012, a 501(c)3 non-profit that I am a member of began the qualifying process to hold charitable gaming fundraisers. We went through all the steps required by the state including being recognized by the local township. By winter, we received a notice from the Charitable Gaming Division that we were approved to conduct charitable gaming under PA 382 of 1972. It turned out that notice was only good for making paper airplanes. At about the same time we were approved, the Governor bypassed the legislature and issued an executive order that transferred charitable gaming licensing like poker, but not bingo or raffles, to the Gaming Control Board. When I contacted the Gaming Control Board about an event we were planning, they refused to recognize us as an approved organization despite our approval letter. A call the the Charitable Gaming Division hoping they would clear up the matter didn’t help. I was told they were just as confused about the process as I was. So, we were back to square one. Actually, we were back to square negative one. The Gaming Control Board’s Executive Director decided he should also throw around some executive authority and he created a moratorium on new locations. We were told we could only host an event at our own venue, which wasn’t possible, or at an already approved venue. No venues in our rural county, or any neighboring county, were approved that I was aware of, and the Gaming Control Board told me they couldn’t supply a list of approved venues to help us out! So we began looking for a new home location that would work for holding a poker tournament. We found a location, submitted all the change of address forms to the State and Federal Government, and then resubmitted our application. Now a year had passed. Several weeks later, instead of receiving an approval, we received an additional list of questions to answer, many of which could have been put on the original application. We submitted that information and waited the six weeks we were told it would take to get approved. Six weeks passed and nothing happened. When I called to complain, I was given some surprising news. Charitable Gaming Board Executive Director Richard Kalm used the power under Governor Snyder’s executive order to issue a whole list of “emergency rules.” When I called and asked to talk directly to Kalm to explain our situation, I was told he didn’t have time to talk to me. Come to find out, I wasn’t alone in my frustration with Snyder and Kalm’s overreach. A lawsuit was filed on behalf of charities and the Senate passed a bill to try to prevent the rules from being implemented. Neither were successful. Republican Rick Jones called the regulations “extremely unfair.” So once again the rules for approval were changed on us mid-game and without notice. Now a year and a half had passed. Once again we took to filling out more paperwork. This time we had to submit detailed information on our dealers, and even more information on our location despite the fact that a Gaming Control Board official had visited the location and met with the owners of the building! After all of that, and more twists and turns that I won’t bore you with, we were finally approved nearly two years after starting the process! Had we have known it would have taken that long, we probably would have opted for a bake sale. 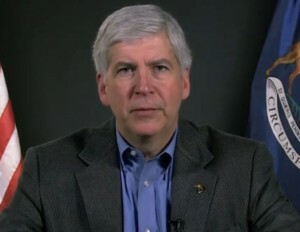 One of Governor Snyder’s main weaknesses is his inconsistency. He repealed the motorcycle helmet law causing as many as 12 more deaths a year, but then he acts unilaterally to complicate fundraising for all charities because of a few bad apples. He passes right-to-work for most public employees, but he exempts policemen and firemen. He says he will make government more efficient, then he issues executive orders that confuse the people they effect and the people who are supposed to implement the rules. He says that Washington D.C. should be more like Lansing, then he uses the sameWashington D.C. tactics to get his way regardless of what anyone else thinks. I’d be wiling to bet that Governor Snyder will continue to struggle with consistency and fairness over the next four years. Then again, to make that bet I might have to file paperwork with the state, and I don’t have an extra two years on my hands! If you’re like me, you are still seeing too much red from the recent mid-term elections to think clearly. So, let’s talk about music instead of elections. In the past few years, I have stumbled on five great songs with economic justice themes. Three of the five artists are from Michigan, and one is from Wisconsin and plays shows in Michigan each year. If you enjoy these songs, you might be interested in knowing that the progressive conference known as Netroots Nation has kicked off a fundraising effort to bring “today’s protest bands and artists into the national spotlight again.” You can help them reach their goal by going to their Indeigogo page and contributing to the cause. Thanks for listening. Now take a listen. but let me tell you brothers and sisters that’s not how you get a bank job done. You can’t walk in there brazen with an Uzi like Patty Hearst. I’m gonna secure myself a seat on the board of directors first.